As the UK joins in marking World Mental Health Day, a unique fundraiser which aims to raise awareness of post-traumatic stress disorder (PTSD) in veterans has been devised by a police officer at the Defence Science and Technology Laboratory (Dstl). 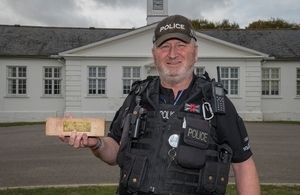 PC Paul Cocoran (known as Coco) is behind the project, called ‘Not Just Another Brick In The Wall.’ It will see volunteers carrying bricks dedicated to the veterans who have lost their lives on operations, or who have sadly taken their own life as a result of mental health issues. If you think of a veteran having problems, he forms an imaginary brick and throws it into his rucksack, if he falls out with his partner, that’s another brick, until he’s weighed down and can’t cope. We want to highlight the issue of PTSD. We’re even taking a brick with a blank plate on; to show this is an ongoing issue and we need to do more. The challenge will be to walk 45 miles of Hadrian’s Wall in Northumberland, over three days, carrying the bricks to the finish. Each brick will have a brass plaque with the name of a loved one inscribed. The plaques have been made and engraved by apprentices at Dstl, Coco hopes the collection will be housed at the Light Infantry museum after the event. It is fantastic that some of our second-year engineering apprentices will be supporting this project by inscribing the brass plaques. Over 150 people have already signed up, including some currently suffering from PTSD. Before becoming a PC, Coco had a full career in the Army and was involved in Army sport. As a veteran, he has carried out a number of unusual challenges, including walking the Coast to Coast way carrying an ironing board, and raising £10,000 by recreating a sitting room on the summit of Snowdon. Not just another brick in the wall means that these aren’t just names; they are soldiers who were sons, fathers, and brothers. Seven Rifles veterans have taken their own lives in the last year alone. I don’t want to inscribe another brick.